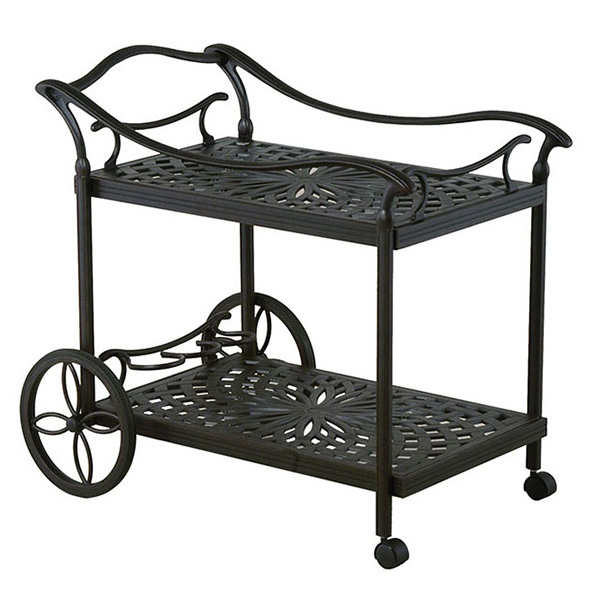 The Mayfair Tea Cart is made with a cast aluminum construction that is typical to Hanamint furniture. The cast aluminum process involves molding the furniture rather into one cohesive piece, rather than using different parts and attaching them together with nuts and bolts. So, except for the wheels, the Mayfair Tea Cart is one cohesive piece of aluminum. The aluminum is all weather and resistant to inclement weather. To enhance this quality, the aluminum is put through a five-step powder coat finishing process for added protection. The Mayfair Tea Cart features four functional wheels that help you take dining necessities, or afternoon playthings, or whatever you need, from indoors to outdoors and back indoors again, as necessary. For dining, the top cast tray is removable for convenient serving tray use. The Mayfair Tea Cart features the pattern found on other Hanamint Mayfair furniture pieces. Mix and match sets or stick with one. Or, let the Mayfair Tea Cart stand brightly and beautifully alone!